In Visual Installer you can choose whether you want to add shortcuts (icons) for the Windows account that is used to install your files, or for all Windows accounts in the computer. Mostly the Windows account that is used for installation is the same as the Windows account that is used to run the software or access the files. But this is not always the case. If different Windows accounts are used for installation and for daily use, you might end in a situation where there is no shortcut (icon) to access your software or files. 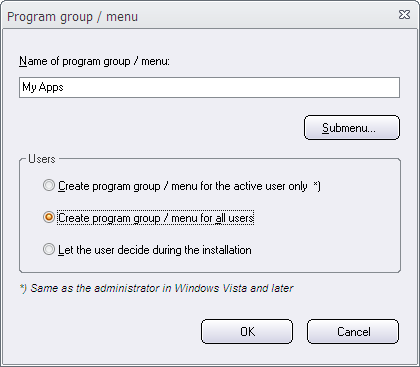 To prevent that this situation occurs, you can open the Program group / menu dialog box (via the List menu) in Visual Installer, and make sure that the Create program group / menu for all users option is selected in the dialog box. If not, you can select this option. Now your shortcuts (icons) will be accessible for all users (all Windows accounts) in the computer. This affects also desktop shortcuts and other types of shortcuts. This entry was posted in Information - Products, Tips. Bookmark the permalink.